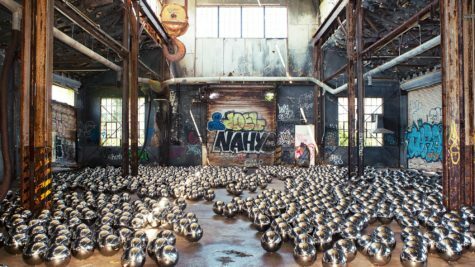 Thousands of selfie-hungry art fiends can now spill into to a former train garage in Fort Tilden on Rockaway Beach in Queens, NY to snap pictures of 1,500 mirrored balls meticulously arranged throughout the space. The juxtaposition of pristine stainless steel and architecture decimated by Hurricane Sandy in 2012 has been carefully orchestrated by Yayoi Kusama, who pioneered the infinity room and is arguably the most popular visual artist in the world. The installation is a new version of her famous Narcissus Garden, which has traveled all over the world since she first presented it at the 1966 Venice Biennale. She worked with director Klaus Biesenbach to engineer the latest version for Rockaway!, MoMA PS1’s annual summer celebration of photogenic, monumental art devoted to rejuvenating the area.